One of the greatest threats to the health of dental and medical professionals, their patients, and the public at large is the failure to properly control the spread of infection in clinical settings. As we’ve discussed in this space before, infection control is a top priority for dental offices and medical clinics across the country. In a previous article on infection control guidelines for use in clinical settings, we outlined at a high level the various infection control guidelines endorsed by industry groups and regulators, including hand hygiene, personal protective equipment, safe injections, medical devices, and respiratory hygiene and cough etiquette. Let’s take a look today at some definitions in the infection control space, as well as why infection prevention and control is so important. According to the World Health Organization, Infection prevention and control (IPC) is a scientific approach and practical solution designed to prevent harm caused by infection to patients and health workers. This approach is grounded in infectious diseases, epidemiology, social science and health system strengthening. IPC occupies a unique position in the field of patient safety and quality universal health coverage since it is relevant to health workers and patients at every single health-care encounter. But Why is IPC So Important? Well for starters, following proper IPC guidelines will put you in a position to reduce the likelihood of one of the most common health care complications: HAIs (Healthcare-acquired infections). A proper IPC program will reduce the risks not only for your patients, but your staff too. Here are the recent facts related to HAIs: Healthcare-associated infections (HAIs) are a major threat to patients at healthcare facilities across the United States. According to the Centers for Disease Control (CDC), HAIs affect between five and 10 percent of hospitalized patients in the US each year, resulting in 99,000 deaths and sparking an estimated $20 billion in healthcare costs. Consider this example: Seattle and King County Public Health is advising patients who received dental services from the George M. Davis Dental Clinic in Burien, Washington, to consider testing for hepatitis B and C and HIV infection. In operation since 1982, the clinic was closed following an infection control investigation by the Washington State Department of Health-Dental Quality Assurance Commission on August 2, 2018. After a complaint that identified multiple infection control problems, the state of Washington performed an inspection with regard to the cleaning, disinfection, sterilization, and storage of reprocessed instruments. These findings prompted the Dental Quality Assurance Commission to suspend the dental license of George Max Davis. Public Health does not know of any infections associated with the clinic but notes that inadequately cleaned and sterilized instruments can potentially spread infections to patients during dental procedures. Overall, Public Health believes that the risk of infection is likely to be low for most patients. Any patients who might have had procedures such as extractions or procedures requiring shots in the mouth may be at relatively higher risk and should be sure to consult with their healthcare provider. Patients who have been experiencing symptoms of hepatitis or HIV which can include abdominal pain, vomiting, jaundice, and fatigue, have been urged to consult with their doctors. As a business, being on the wrong side of an infection control mishap can spell disaster for your future, as was the case with Dr. Davis in Washington state. 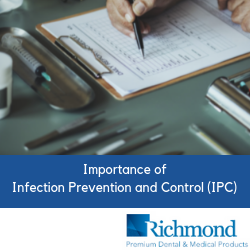 At Richmond Dental and Medical, we try to make implementing infection prevention and control a little easier, as we have certain products spanning multiple categories grouped specifically to help dental and medical offices for purchase for their IPC programs. These products include the Level III Path-O-Guard® Face Mask and Level I Earloop Face Mask for provider protection, as well as Pellet Dispensers and Infection Control Roll Dispensers, and SteriPocket® nonwoven sponges. Contact us to learn more about how Richmond can outfit your practice with a full lineup of dental and medical supplies aimed at implementing the highest levels of infection prevention and control.